Miracle Oil Tea Tree Shampoo is a sulfate-free shampoo that helps soothe dry scalp. Give your hair complete moisture without stripping away natural oils. 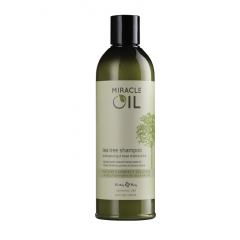 Perfect for all hair types, Miracle Oil Shampoo enhances the health and natural look of your hair and is gentle enough for daily use. Fragrance: Fresh and clean.